You see that green fake-grass-looking thing? 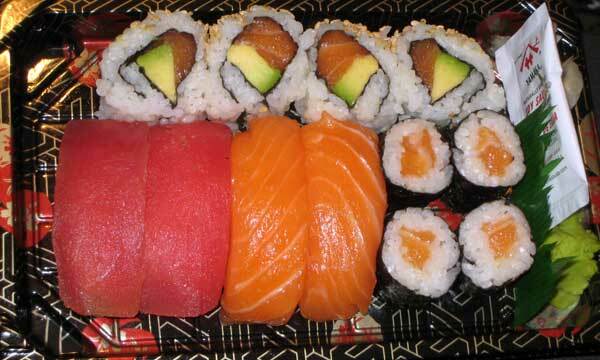 See how it’s in between a piece of salmon sushi and a piece of the salmon roll? It’s not supposed to be there. The fake-grass thing is supposed to separate the ball of wasabi and bunch of ginger from the fish. It’s there so that one piece does not get overpowered with flavor. It’s not there purely for decoration. I thought this was common knowledge, or at least common sense. I have tried to explain this to the sushi making guy at my lunch place, but he just nods and smiles. I assume I could tell him that his house was on fire and I would get the same nod and smile. Since there really isn’t another sushi place in my neighborhood that’s as convenient, I guess I’ll have to put up with one piece of my salmon roll being extra wasabized. 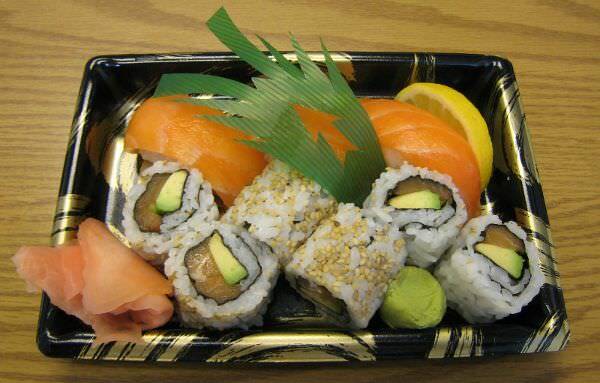 February 10, 2009 — Compare and contrast the below sushi dinner. Notice how the chef used the soy sauce packet strategically with the green fake-grass thing to separate the sushi from the condiments.